Today being Halloween in the United States, I thought a post with an orange and black color scheme would be appropriate. The first topic that came to mind is Pacific Fruit Express refrigerator cars, which became orange in 1929 and remained so thereafter. I have been gathering information for awhile on the topic of the appearance of these cars, and today‘s post is the first part of reporting on that. This is different from the PFE lettering posts of a few months ago (which can be found at: http://modelingthesp.blogspot.com/2016/06/pfe-lettering-post-ww-ii-part-2.html ). First, a few facts. In the 1920s, PFE enjoyed a very large increase in business, and responded by building a very large number of additional cars. These were primarily classes R-30-12 and R-30-13, with different underframes but essentially identical superstructures. These additions to the fleet during 1918–1926 totalled over 20,000 new cars. At the start of this building program, PFE had owned about 13,000 cars; at the end of it in 1926, they owned more than 30,000 cars. All had steel underframes and wood-framed, wood-sheathed superstructures. This huge building program is described in much more detail in the aptly-named chapter, “PFE’s Roaring Twenties,” in the PFE book (Pacific Fruit Express, 2nd edition, Thompson, Church and Jones, Signature Press, 2000). So the first point to be made about PFE cars by, say, 1948 is that practically none of the 1920s cars, with car numbers below 36400, would still be in service under those numbers. By then, most of them had been rebuilt and were still in service, all right, but with new car numbers. The second point, which I will only touch on in the present post, is that PFE washed thousands of its cars every year in this period (1920 to the mid-1950s). That could be done effectively by PFE because the average PFE car made 10 to 12 cross-country trips a year, and passed through a PFE shop every time when it returned empty, as they almost always did. That was to permit necessary repairs and keeping cars in tip-top shape. Thus any truly dirty car would almost certainly have been washed before it ran very long in that condition. That is the background for the following model photo, which shows one of Richard Hendrickson’s PFE cars. It even has a few replaced sheathing boards to the right of the door. Note the car at right in fresh PFE orange paint, and note also the scuffed marks behind the ladder of PFE 26218, from crewmen climbing to the roof. This very dirty car, a member of Class R-30-12, is certainly not representative of the PFE fleet at the time Richard modeled, 1947, though in fairness to Richard’s choice, one could rationalize its appearance by the wartime rule that reefers had to run freely rather than their usual returning-home-to-owner-empty pattern, and thus this car might have stayed off-line a long time. The car at the right in the above photo, however, shows a much more typical clean car. In my modeling year of 1953, the then-current paint scheme was the all-orange sides, with stripes above and below reporting marks removed, and periods omitted from the initials, as seen below on PFE 48661. I want to come back to the topic of car washing, and will provide a glimpse of annual data on car washing, but for now, this introduces the topic of car appearance. And Happy Halloween! Begun by Martin Lofton as a promotional vehicle for his Sunshine Models business, and held every October for many years in the Chicago suburb Naperville, the conference has changed somewhat since Martin’s death. It seems to have found a new home in Lisle, Illinois, the town adjoining Naperville. It’s now titled the Chicagoland conference by new director Mike Skibbe, and this year, running October 20–22, was the 23rd annual meeting. I have not been to every one of these, but have certainly attended the great majority of them, and was looking forward this year to see how Mike would manage the meeting. In brief, he did a great job, and the enthusiasm and “buzz” at the meeting was definitely upbeat. Attendance was about 330, not as large as the largest turnouts Martin Lofton achieved, but better than most years. There was a full schedule of clinics, of which I gave one (on my waybill system), and clinic rooms were usually well filled. I felt that most talks were very good to excellent. For me, a high point of RPM meetings is the model display, and this year the turnout was of high quality, though not as numerous as some years. One of the exhibits, by Ray Breyer, typified what I think of as the best kind of “instructional” display, one that shows models in progress. 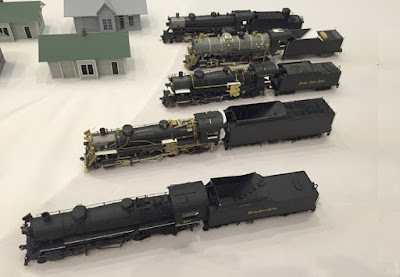 Here are a bunch of Nickel Plate steam locomotives, most with brass and styrene detail parts added but not yet painted, clearly showing the work in progress. There are always manufacturers in attendance, some of whom man tables to offer their wares, but sometimes a new product is simply put in with the displays. 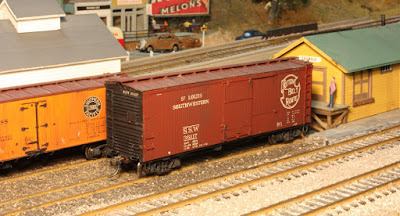 This was the case with the new Cannon and Company 5000-series box car kit, with examples built by Dave Hussey. (You can visit the Cannon website at: http://www.cannonandco.net/ .) This particular one is kit 5011 for the Great Northern, numbered 138224. An especially well-done freight car I liked was by Steve Hile, starting from a Proto2000 AC&F tank car of 8000 gallons, adding a dome from Tom Madden to represent a retrofitted second compartment (with rows of Archer rivets securing the interior heads), and with upgraded details, such as Yarmouth sill steps. The weathering on UTLX 530 is very nicely handled too. Another manufacturer present was Frank Hodina, of Resin Car Works, who I know sold quite a few new kits (see more about this business at: http://resincarworks.com/ ). Here he is at his table, with the remaining stock of kits in front of him. I bought one of his boiler load kits myself. This is the kind of manufacturer seen only at meetings like this one. 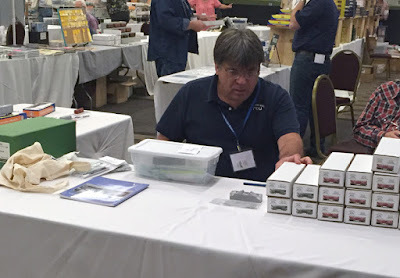 In my previous post (see: http://modelingthesp.blogspot.com/2016/10/waybills-part-54-more-shipper-guides.html ), I mentioned another seller you would only see at a meet like this: Ted Schnepf and his “Rails Unlimited” business, especially his superb reprints of railroad-issued Shipper Guides. 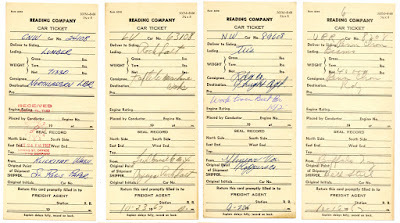 You can visit Ted’s website for more information on purchasing these guides, at: http://railsunlimited.ribbonrail.com/Books/shippers.html . The Friends of the Freight Car dinner was held on the Friday night, as has been the case for several years. 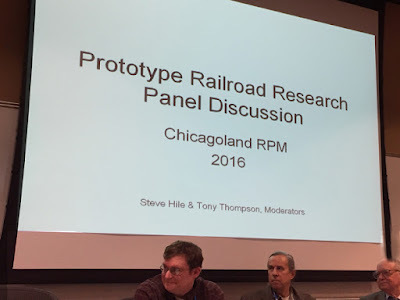 This year, instead of an after-dinner speaker, a panel was presented with the goal of informing attendees about the resources available at several railroad archives, and explaining how to go about tapping those resources. This was Steve Hile’s idea, and he organized most of it, with a little help from me and from Mike Skibbe. Here is the beginning of the session, with three panelists at the bottom. From left, they are Nick Fry (Barriger Library, St. Louis), Kyle Wyatt (California State Railroad Museum, Sacramento), and Ted Anderson (Pullman Library, Union, Illinois). Out of view at right was Roger Hinman, who gave the perspective of a user of archives like these. I apologize for not getting more of the presenters’ bodies into the photo! 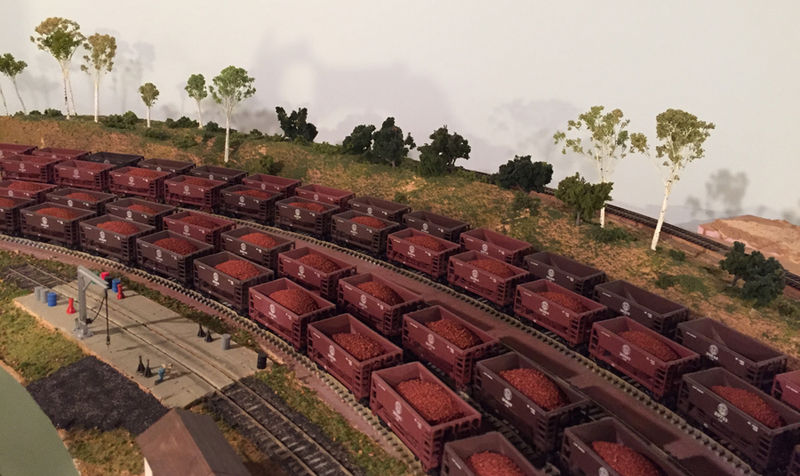 Often at these meetings, there may be an “off-site” opportunity to operate at a model railroad or two. This year, I enjoyed operating at the layouts of Bill Darnaby and Bob Hanmer. At Bob’s, I shared the yardmaster job at High Grade Yard on the DM&IR, where the great majority of the work involves entire trains of ore cars, loaded or empty, a really neat experience. This photo conveys the flavor of this yard. This was a good meeting, and frankly, an improvement over the meetings held in recent years under Mike Skibbe’s predecessor. I look forward to more good conventions in this fine series. Anyone who got discouraged with recent versions of this event should definitely plan to attend next year. Mike has a good feel for what makes a good meeting, and great organizing skills, along with plenty of helpers to make it all work. I will certainly be there in 2017. 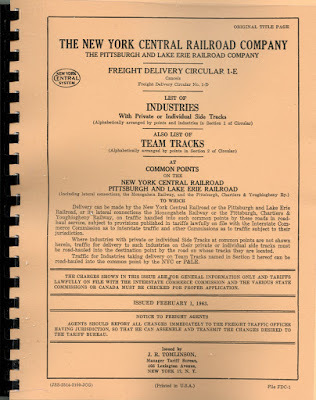 I have written, in past posts about waybills, that invaluable sources of information about shippers and consignees of prototype railroads are the Shipper Guides or Directories issued by most railroads. I even showed some of the waybills I developed with use of the Guides (you can read that post at: http://modelingthesp.blogspot.com/2015/11/waybills-part-44-shipper-guides.html ). 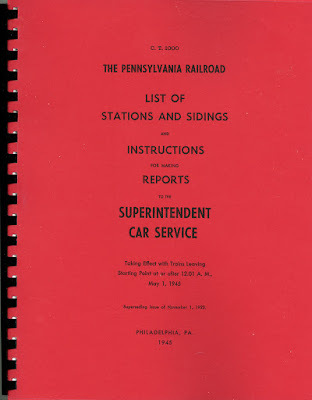 These Guides tend to be hard to find, even at railroad museums, but Ted Schnepf’s “Rails Unlimited” operation has reproduced a number of them and has them for sale. 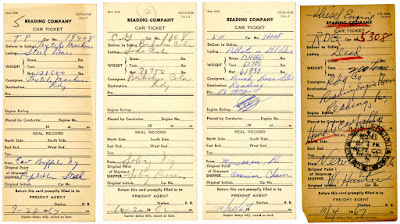 Here is a link to Ted’s page for these particular documents: http://railsunlimited.ribbonrail.com/Books/shippers.html . I also mentioned these Shipper Guides in a post about resources for information about waybills, along with a number of other books and documents (at: http://modelingthesp.blogspot.com/2012/02/waybills-18-resources.html ). 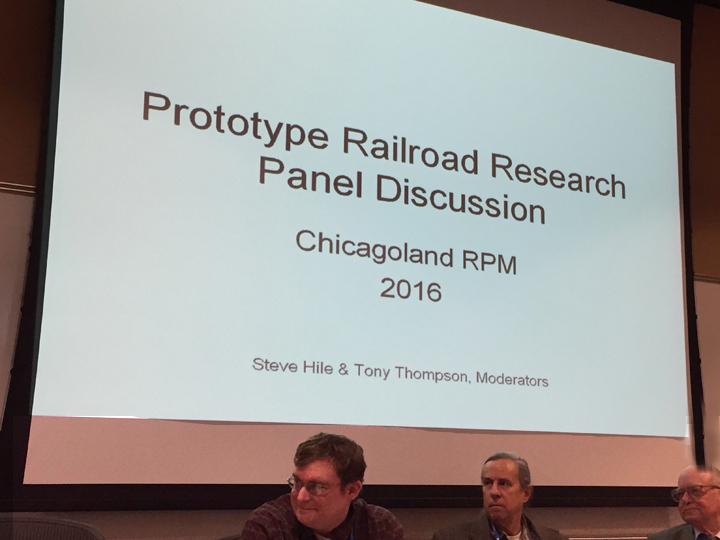 Last week, I attended the 23rd annual Railroad Prototype Modelers meet in the Chicago area (formerly known by the name of its original site, Naperville), and I will post a report on the meet shortly. An item of news this year is that Ted Schnepf has continued to find and reprint more of these guides. Some of the previous ones were from smaller railroads, for example, Chicago and Eastern Illinois, but his three new ones are truly major railroads, all eastern: Pennsylvania, New York Central, and New Haven. These add a tremendous amount of additional information about shippers, and I immediately bought two of them. 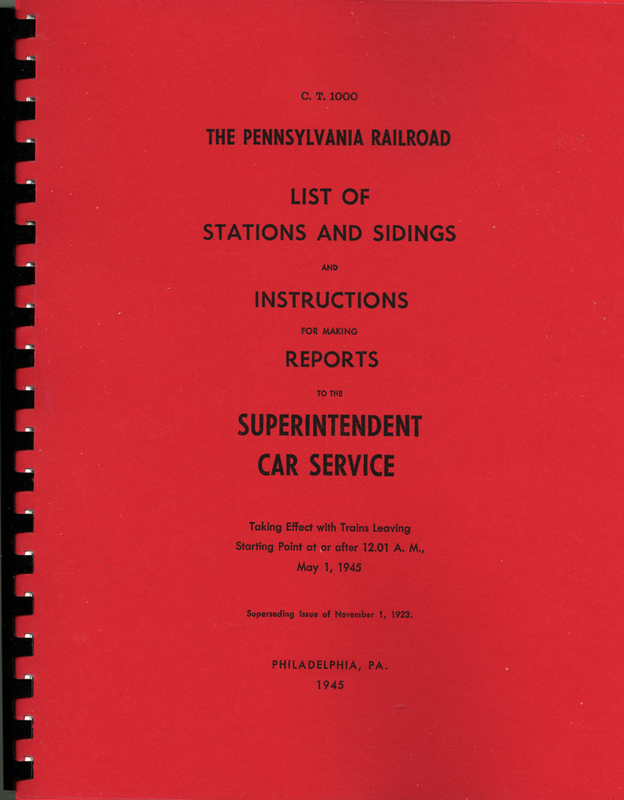 Shown below is one of the two, the PRR guide, dated 1945. Just the thought of a list of all shippers on this huge and very busy railroad is mind-boggling. The other guide I bought is the New York Central one, dated 1963 but still with a great deal of useful information for my modeling year of 1953. 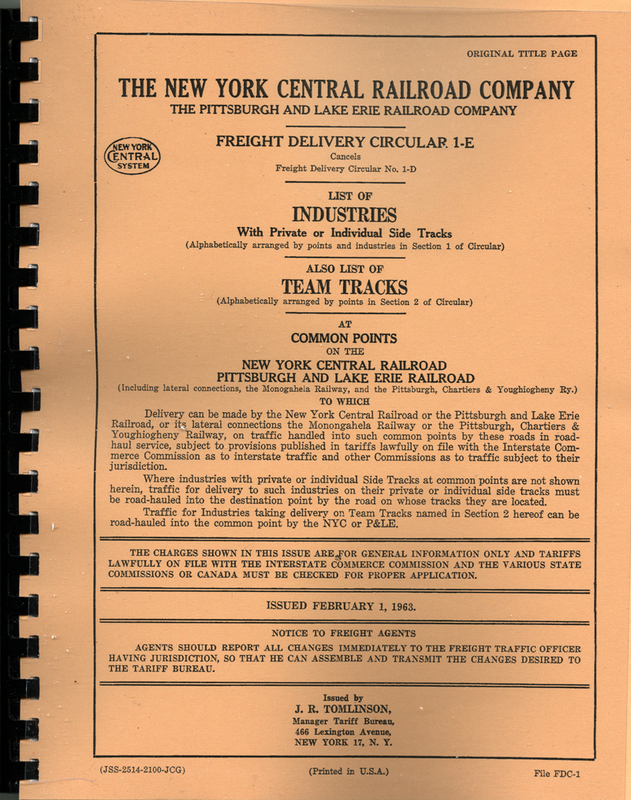 Note that the cover mentions that it includes Pittsburgh & Lake Erie, as well as P&LE subsidiary Pittsburgh, Chartiers and Youghiogheny (PC&Y), thus extending this guide to even more territory. I just cannot recommend these Shipper Guides highly enough. They are simply a superb resource if you want to use prototype shippers and consignees in your layout operation, as I try to do. Go to the “Rails Unlimited” site, listed in the first paragraph above, and see which one(s) will suit your needs. 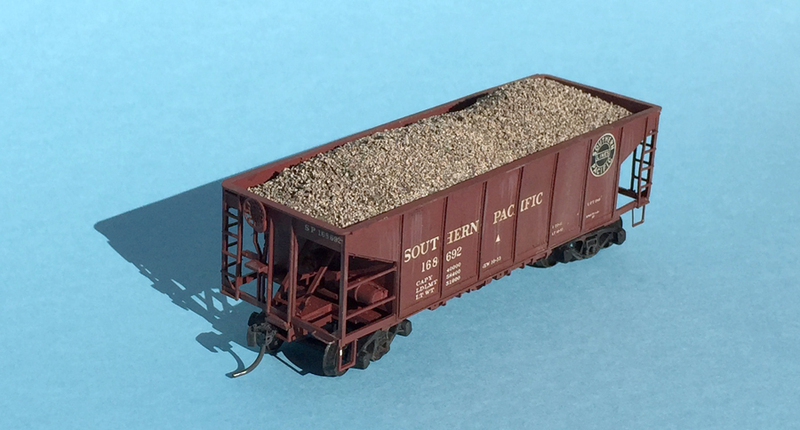 I have written a number of posts about loads for open-top cars, including one a few years ago about bulk materials like coal and ore (you can read the post here: http://modelingthesp.blogspot.com/2012/02/open-car-loads-bulk-materials.html ). I came back to this topic in two recent posts about chromite mining and how to model it. (The following link is to a post which also gives the previous link: http://modelingthesp.blogspot.com/2016/10/modeling-mining-part-2.html .) I did receive a couple of questions via email about the loads, and wanted to say more about how I make these. The first point to recognize about loads like this is where they will sit in the car. A model with slope sheets can have the load sit on the upper part of the slope sheet. A flat-bottom car like a gondola will need a platform to raise the load up to the proper height above the floor. Then there is the question of weight. Usually my model freight cars are weighted so that they can run all right when empty, meaning that I don’t then want my loads to add too much weight. Thus many of my load platforms are balsa or other lightweight material, and the shape of the load is created by paper mache or similar light material also. Occasionally, though, a car may benefit by added weight in the load. One example is the resin ballast hoppers once sold by Bruce’s Train Shop in Sacramento, which are awfully close to weightless unless you can add weight somewhere. I have used weighted loads for this purpose. Several of my loads use a styrene strip as the base for the paper mache, as it is an inert material with respect to a water-containing material like paper mache. The balsa or other platform can go underneath, usually glued to the styrene with canopy glue, an excellent adhesive for dissimilar materials like styrene and wood. (For anyone not familiar with canopy glue, my brief description and comments about it may be of interest; that post can be found at: http://modelingthesp.blogspot.com/2013/05/a-few-words-in-praise-of-canopy-glue.html ). The photo below shows the bottom of two load platforms after the first construction step. 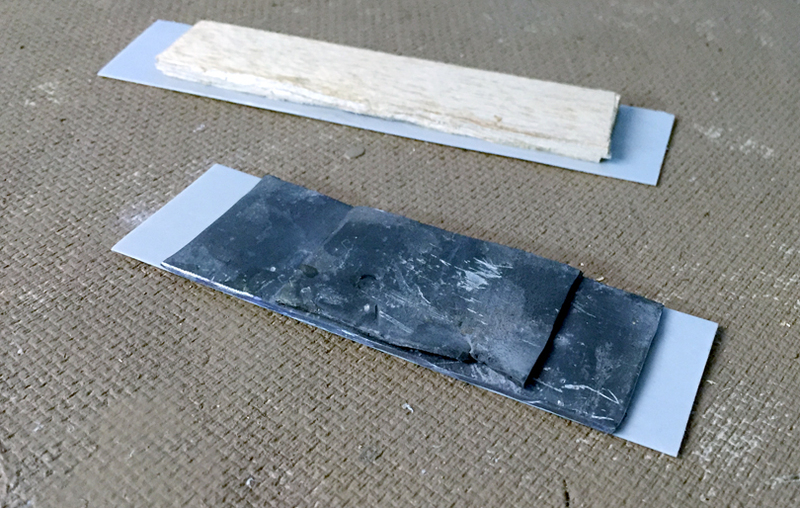 I have glued a platform or base to the gray styrene strip, which was sized to match the open-car interior for which the load is intended. The foreground platform is lead sheet, since this is a load that will sit on the slope sheets in the ballast hopper described above. The lead is from a sheet of roofing material. The longer load is for a 40-foot GS gondola. The next question is how to represent the load shape. 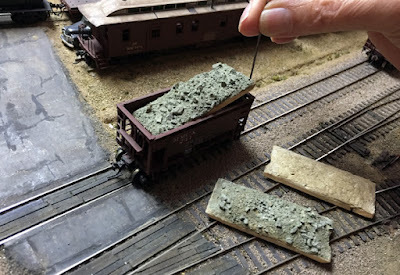 Typically I apply paper mache (Sculptamold or equivalent) to the styrene top of the load platforms, and shape it to whatever kind of loading process I imagine to have been used, accounting of course for the slumping that would have resulted with any car motion. Here are both of the above platforms, seen from above, with the paper mache step completed. You can see that the shorter load, intended to be ballast, has a higher “hump” at one end than the shape of the rest of the load. To try and show what I mean by load shape, the gondola load, the lower of the two in the above view, is seen in the photo below from a lower angle. This is intended to represent ore dumped from a truck dump, and the car having been moved between truck loads to distribute the load more evenly. The next step is just like ballasting track. The paper mache part of the load is coated with white glue (or matte medium), the desired bulk material is sprinkled on, and if necessary, more bulk material added and more adhesive sprayed or dripped onto the load, until the desired coverage is attained. 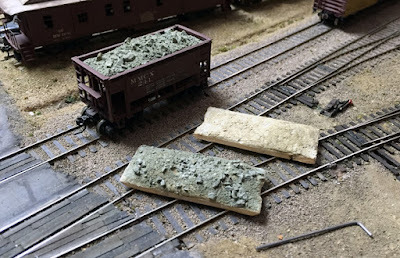 Here is my ballast load, made by this method. I used the same ballast that I apply to layout track. The load fits nicely into the car and matches with about how full prototype photos of SP ballast cars usually appear. 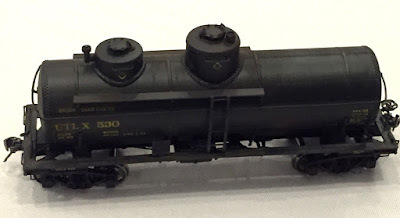 The model is lettered for SP Class H-70-11, which is what the model was constructed to depict. This method for making bulk-material loads for open-top cars is simple, fairly quick, and works well. Loads made this way have held up for years of layout operation. If you don’t have enough loads, or enough of the right kind of loads, or the right loads for specific cars, try making your own. It isn’t very hard, and you get what you want for your cars. In several previous posts, I have discussed the use of Empty Car Bills and related kinds of “simplified” waybill documents. 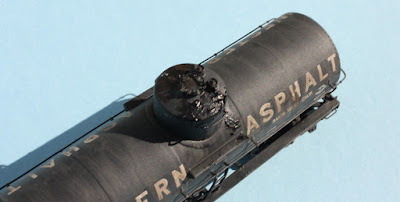 A relatively recent example (see it at: http://modelingthesp.blogspot.com/2015/12/waybills-part-46-more-car-slips.html ) added information about some Northern Pacific documents. The present post shows some Reading Company documents like this, of an interesting character. These documents were loaned to me by Rob Mantler, who has my gratitude for his generosity in sharing. 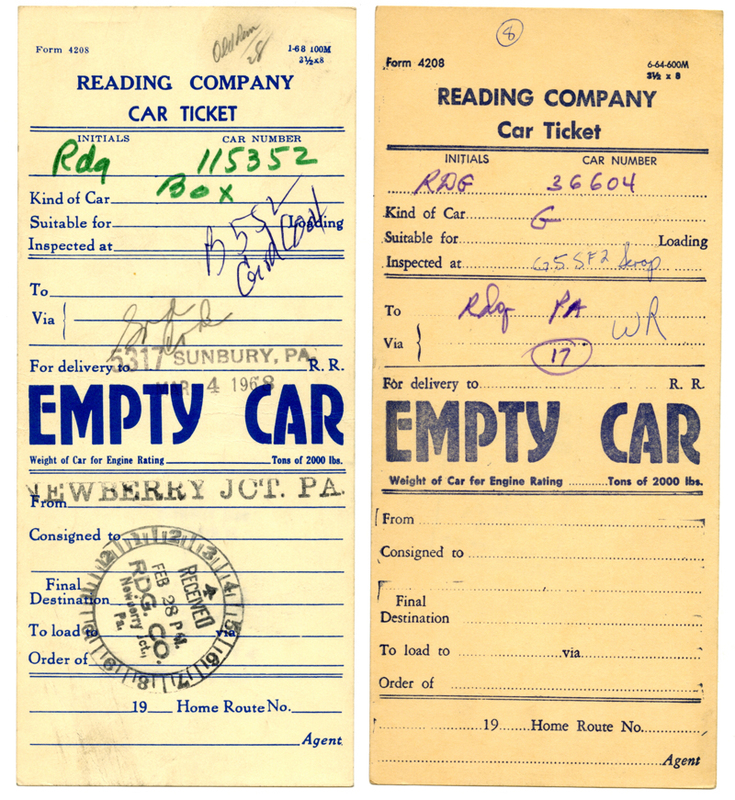 Some of the tickets are for empty cars, as I have shown earlier for a considerable number of railroads (you can find many of these posts by using “Empty Car Bill” in the search box at upper right). These are interesting in that they are filled out. The two cars here are Reading 36604, a 52-foot gondola, and RDG 115352, a 50-foot single-door box car. The latter slip has added interest with both a “from” stamp (Newberry Junction) and a “to” stamp (Sunbury PA). 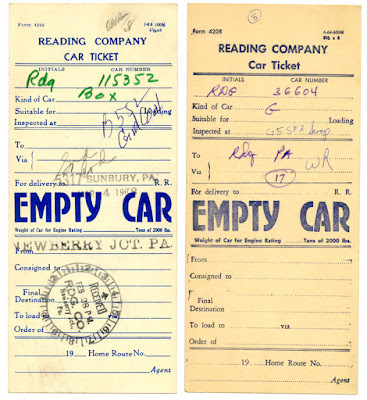 Another interesting aspect of these two tickets is that they are a different format from the Reading Empty Car Bills I showed in a previous post (it can be found at this link: http://modelingthesp.blogspot.com/2015/04/waybills-part-40-more-empty-car-bills.html ). The one on the left, for CNW 24108, a 40-foot box car, is a load of lumber from Klickitat, Washington. Next to the right is Lehigh Valley 63108, another 40-foot box car, carrying rock salt, though the ticket doesn’t indicate if it is bulk salt or bagged (I would guess the latter). Next to the right is N&W 89608, a 45-foot gondola, carrying ties for the use of the Reading Company, and destined to a work train at Belt Bridge (as I read the ticket). Last, on the far right, is Union Railroad 8208, a 42-foot gondola, carrying steel beams from Bethlehem Steel to Penn Iron Works in Reading. All these tickets are interesting in part because they give business names of shippers and consignees. Here is another group of four tickets, equally interesting. One in particular, at the right of this group, deserves detailed attention, as it is a use of a ticket like this that I would not have expected. But before taking up that ticket on the right, let me describe the other tickets in this group. First, on the left, is a Texas & Pacific car, no. 19408, a 52-foot gondola, carrying steel bars from Republic Steel in East Buffalo to Textile Machine Co. in Reading. 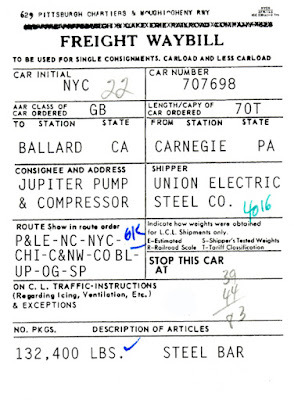 To its right is a ticket for Central of Georgia 1808, a 2003-cubic foot covered hopper, carrying soda ash from Solvay, New York to Berkshire Color in Reading. Then next to the right is the ticket for WM 34008, with a load of pallets of steel wire from American Chain in Monessen, PA to a steel fabricator in Reading. This car is interesting because it was a 50-foot single-door box car with DF loaders installed. That ticket on the far right is for a diesel locomotive being hauled dead in train, from Newberry Junction to the Reading engine house in Reading. Locomotive 5308 was an Alco Century 630, and in October 1967, date of this ticket, was evidently in need of repairs. Most railroads bought small orders of this Alco model, including Reading with 12 units, of a total production of 70 locomotives. It is interesting that a car ticket, just like any other car in a train, was made out for this move. I should also note in passing that all these documents are roughly the size of an 8.5 x 11-inch waybill, folded in half the long way, permitting their easy combining into a stack of folded waybills. 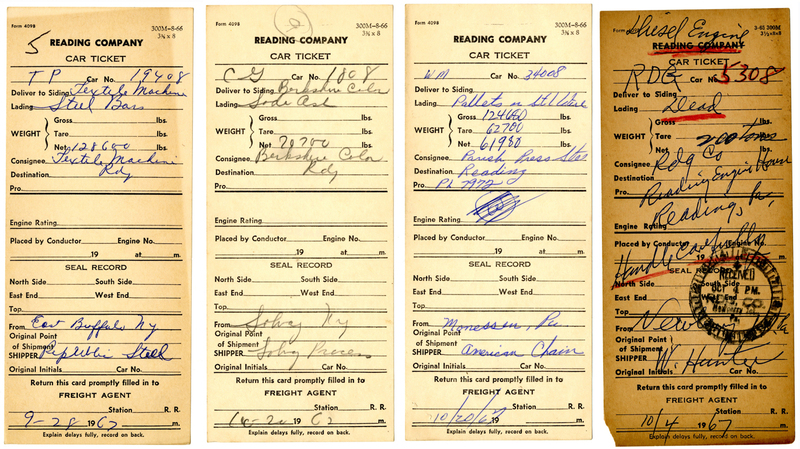 Obviously these “car tickets” appear to substitute for waybills, but perhaps there was not one for every car, but a mixed set of documents. And as one observer mentioned to me, the pigeon holes in cabooses were this size also, so even if there were no actual waybills, these tickets could still be handled in the usual way by a conductor. I really enjoy seeing documents like these, and appreciate the loan by Rob Mantler. 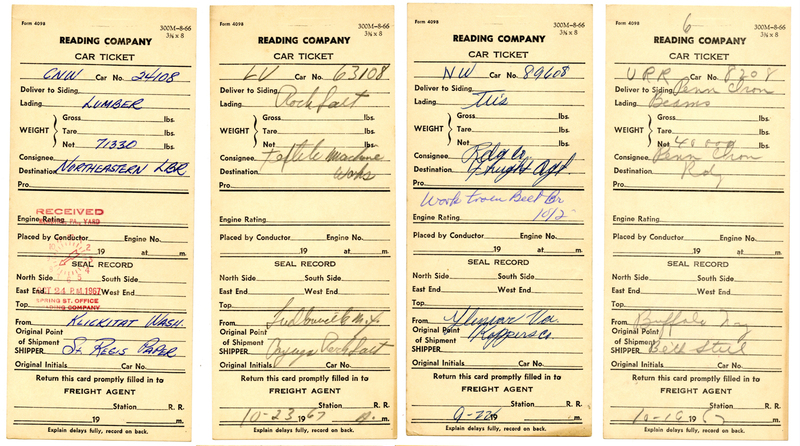 Every one of these sets of freight car documents enlarges our knowledge of a vanished time in railroading. In the first post in this series, I wrote about ways to find out whether there was any significant mining in the area you model, and some examples of what I have learned about chromite mining in the locale of my own layout. (You can read that post at: http://modelingthesp.blogspot.com/2016/10/modeling-mining-in-your-locale.html .) In the present post, I discuss modeling options and challenges. The first issue can involve layout planning, as to whether a mine can be included on the layout, and what it should look like. Most chromite mines were not very big or very deep, so did not have grand hoisting works, giant breaker buildings, or mammoth stamp mills. 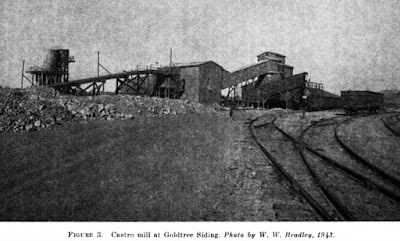 In fact, most of them trucked their ores to rail loaders, as in the Castro Chrome Company loader of which I showed the photo in the previous post. In that case, the truck distance was about 6 miles from mine to loader. Other mines described in the California Division of Mines report I showed previously had similar or longer distances of truck hauls. So my first conclusion is that a truck dump would be a good way to load chromite ore in my area. Second, what kind of ore would it be? I mentioned in the previous post that fairly pure chromite is a glossy dark brown or black color. But by the era I model, most of the high-grade or massive chromite deposits had been mined already. That means that mining would consist of disseminated ore, usually with some of the country rock with it, or reprocessed mine dumps, where modern methods could find additional low-grade ore discarded during mining of high-grade ore. There was also the reclaiming of what is called “float,” meaning ore chunks that have eroded from the top of an ore body and moved downhill in water courses. With a dense mineral like chromite, the float can readily accumulate at slower-moving parts of stream courses.There was extensive float recovery in the area I model, so that kind of ore might also move to truck dumps. 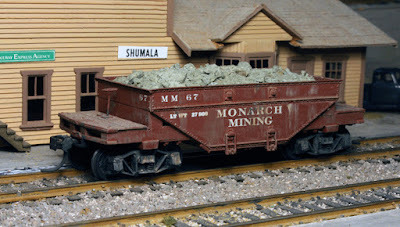 I now plan to add a truck dump on the layout to permit loading of chromite ore. That modeling is not yet underway, but I have a couple of locations in mind. There is currently a Walthers kit for a truck dump (Cornerstone kit no. 4058) and I might use components of that kit for the dump. I’ll return to that in a future post. This is an O-scale Gilpin Tram ore car (offered as a kit by Grandt Line), simply given HO scale detail parts and trucks. I mentioned in the previous post, cited in the first paragraph at the top of this post, that chromite ore is pretty dense, 280 pounds per cubic foot. This sounds like a job for an ore car like the Mesabi ore jennies, 70-ton cars only 20 or so feet long, with cubic capacities ranging from 850 to 1250 cubic feet. But in fact iron ore is not as dense as chromite; 70 tons of chromite would only occupy 500 cubic feet. So even an ore jenny would not be filled with pure chromite, to stay within load limits. But disseminated ore, containing matrix rock as well as ore, would be less dense, and an ore car could be portrayed as entirely full. I still own a couple of kits for the old Model Die Casting white metal ore cars, and built up one of them to letter for Monarch Mining. I chose the reporting marks MMCX for this (there was no user of this mark in the year I model, 1953). My loads for cars like this have been shown previously (for example, in the post at this link: http://modelingthesp.blogspot.com/2012/02/open-car-loads-bulk-materials.html ). I make a base and apply paper mache to it to form the shape of the “heap” of bulk material for the car. Usually with these loads I leave a small gap at one end or one corner, and keep handy a small hook-shaped piece of wire that can be simply hooked under the load and lifted free of the car. In the photo below, one load is in the ore car, and two more are on the ground, one still just paper mache without the “ore” glued to it yet. At bottom right of the photo is a short wire tool for lifting loads, for example from the notch visible in the right end of the ore load in the foreground. To illustrate the use of the wire took in lifting loads, the photo below shows this in progress. This technique with the wire tool is a simple and dependable process, and it allows loads to be built which fill the car. One sometimes sees quite undersize loads in use on some layouts, presumably for ease in removing them, but instead I would prefer to use a tool like this (or a magnet to attract a piece of iron glued to the bottom of the load), and have full-size loads. There are areas of the country, and thus types of layouts, where mining is naturally a dominant industry. Coal in the Appalachians, in Illinois, and other areas, iron ore in the Mesabi Range, copper in the Southwest, precious metals in the Mountain West, and a few other examples, come immediately to mind. But there are lots of other geographical areas where mining is a minor part of the picture. I model the Central Coast of California, and there is certainly no giant category of mining or mineral development in that area. But is it zero? This is a question that can be asked anywhere, not just for my area, and I discuss in this post ways a person might acquire answers. The first point of reference is of course the geology of the area you model. Many parts of the U.S. have quite complex geologic histories, and I can think of no more eloquent evocation and elaboration of that history than John McPhee’s Pulitzer Prize-winning volume, Annals of the Former World (Farrar, Strauss & Giroux, New York, 1998, available in paperback). One reviewer called it “geopoetry . . . from a master stylist,” as eloquent as you will find. But this may be deeper than you want to go, and in any case, complex geology alone does not identify the presence of ores. An ore is not just a mineral, it is a mineral that can be economically mined and refined for use. It is an economic definition, not a mineralogical or geological one. So to know about the presence of ores, you need further sources. For decades, the U.S. Geological Survey (USGS) and, in many states, State offices of geology or mining, have studied and reported on ore occurrences. These reports are available in hard copy, even now in many cases, both new and used, and many are now on line in digital form. I can illustrate with two such reports which deal with my own layout locale (research will show you whether your own area has the same resources). 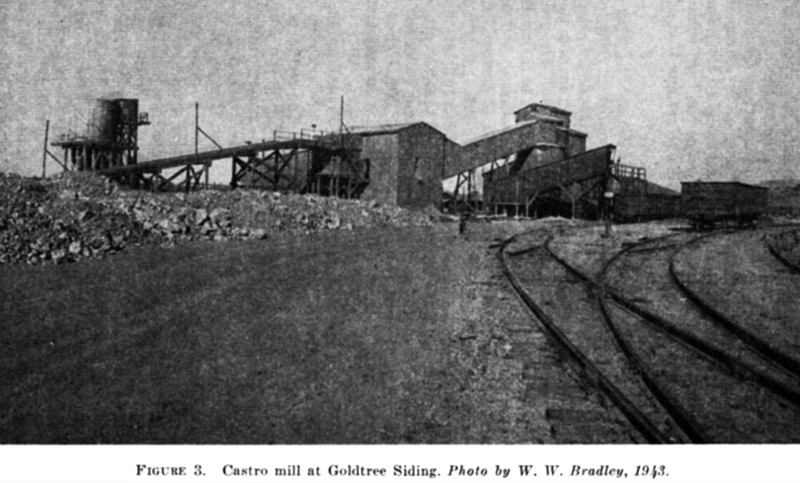 For the region near and south of San Luis Obispo, this 1915 guidebook mentions chromite as the primary mineral being produced, This led me to follow up on the subject of chromite. 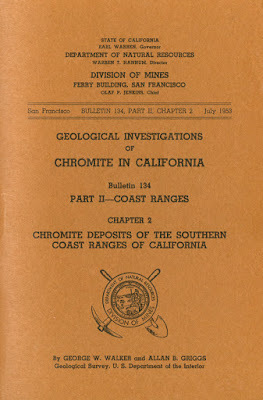 I then found a second and in some ways more valuable source, a California Division of Mines publication, Bulletin 134, Part II, Chapter 2, of July 1953; it is part of a series entitled Geological Investigations of Chromite in California. 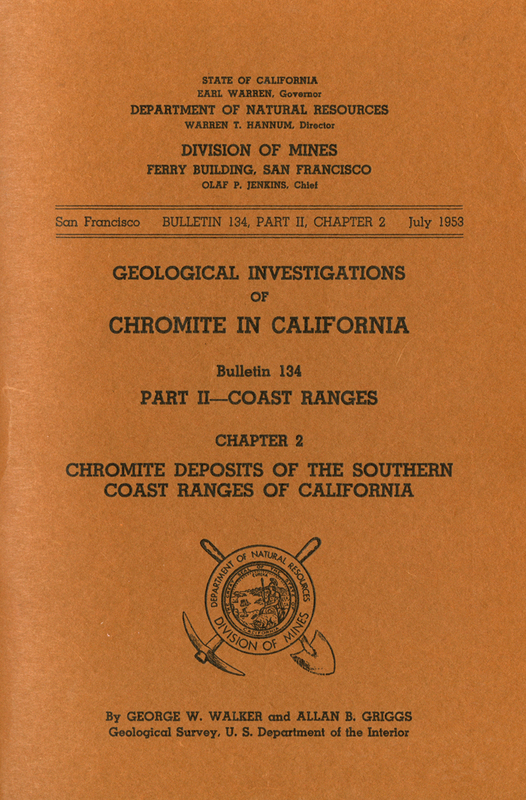 Part II of Bulletin 134 covers the Coast Ranges of California, and Chapter 2 is about “Chromite Deposits of the Southern Coast Ranges of California.” Authors are George W. Walker and Allan B. Griggs of the USGS. (I’ll say more about what “chromite” is in a moment.) Like the book shown above, it is 6 x 9 inches in size and is paperbound, and includes a number of maps. It covers exactly the area in which my layout is set. 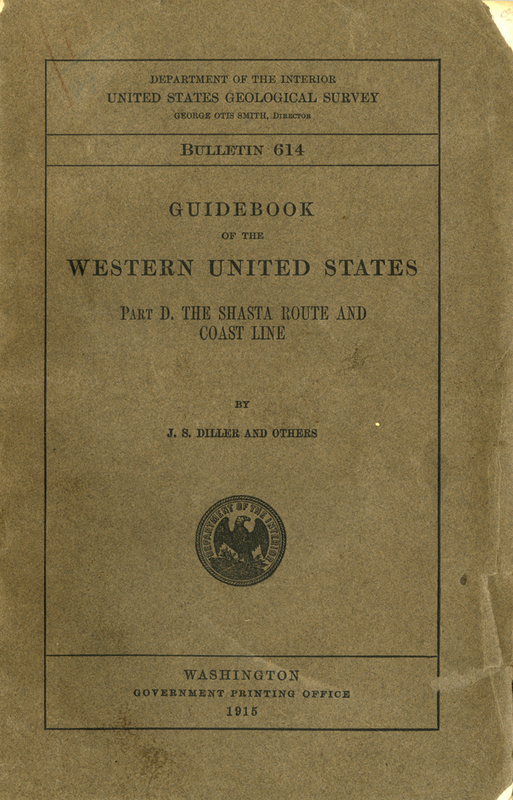 Also of value, though more general, was The Central Coast Geologic Guidebook, Bulletin 61A, Division of Mines, State of California, Sacramento, 1937. One additional article of value for me was one entitled “Chromium,” by Roland D. Parks, published in Mining Engineering, page 469 in the issue for May 1952. Any engineering library near you is likely to have this journal, a source for information about mining of many metals and minerals. The great majority of chromite mined in California has been in San Luis Obispo County, and my layout is situated in the southern end of that county. Again, chromite is the major ore mineral found in this area. There were once small pocket mines for silver in this area, but that was in the 19th century, and that kind of mining was long gone by my modeling year of 1953 (coincidentally the year of the report shown above). By 1953, as in 1915, chromite was the mining mineral of significance. What is chromite? It’s the primary ore for production of chromium and chromium compounds, all over the world. It is a mixture of ferrous oxide, FeO, and chromium oxide, Cr2O3, nominally with one molecule of each oxide, thus sometimes written as FeCr2O4. But in nature, the ratio of FeO to Cr2O3, is variable, and in addition other elements such as aluminum and magnesium can substitute for the chromium. Accordingly, the quality of an ore can be quantified as the ratio of Cr to Fe, as well as the percentage of Cr2O3 in the ore. Most California ores were good quality, that is, with ratios of Cr : Fe of around 3 : 1. In California deposits, the ore was described as either “massive,” meaning large lenses or blocks of the chromite mineral, up to several tons in size, or “disseminated,” meaning individual mineral grains scattered to various degrees in the matrix rock. The latter ore type, of course, required further processing to separate the chromite from the waste rock. The surrounding rock is usually either olivine, a typical intrusive igneous mineral, or if the original igneous rock had been metamorphized, that rock has been transformed to serpentine. Both those rock types are greenish, so that disseminated ores would have such a color. The chromite itself was glossy black or dark brown, and quite dense. Though I can’t include that location on my layout, I show the photo to suggest the kinds of resources that geological reports can contain. In the view above, incidentally, are three Enterprise GS gondolas, likely SP. In the interview cited above, Mac did mention the black ore which was so dense that the load in each 50-ton gondola was not very deep in the car. Chromite weighs about 280 pounds per cubic foot, which means that loading a 40-foot gondola one foot deep would give a weight of more than 90,000 pounds. Well, that’s the background to the mining in my locale. Yours may be entirely different, but do be aware that there are resources to help you find out about it. I will return in a future post to modeling options for the chromite traffic from the area I model. 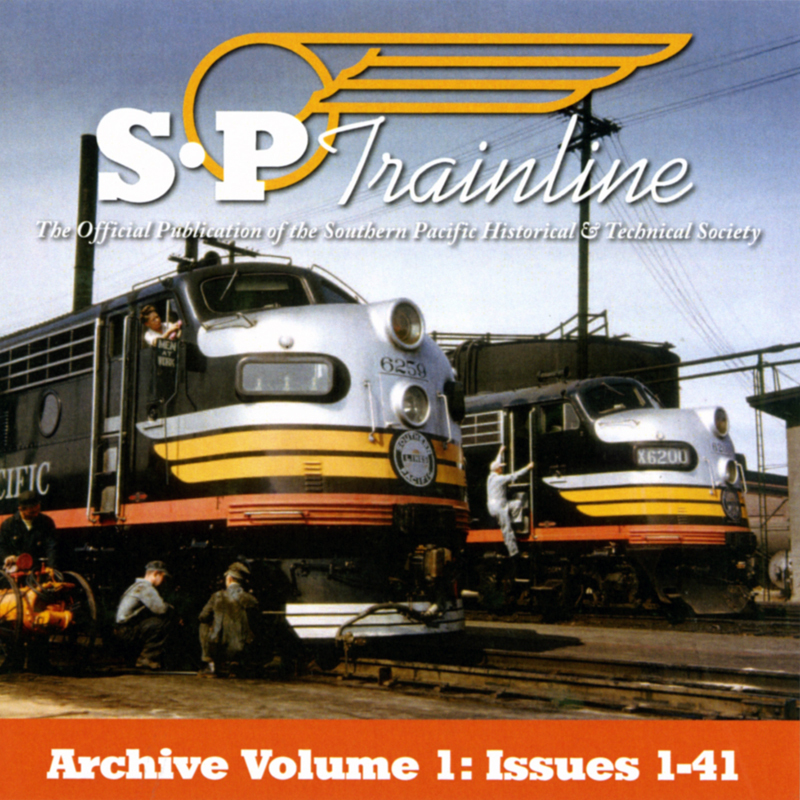 The Southern Pacific Historical & Technical Society (SPH&TS) magazine, Trainline, has been published quarterly since the mid 1980s (in the early period, frequency was irregular). Back issues in hard copy remain available for many of the issues and can be purchased on the Society’s website, which can be found at: http://www.sphts.org/ , and click on “Company Store.” In the 1990s, the SPH&TS Board of Directors tended to reprint older issues when they sold out, so that they would remain available, but more recently older issues have been allowed to go out of print. 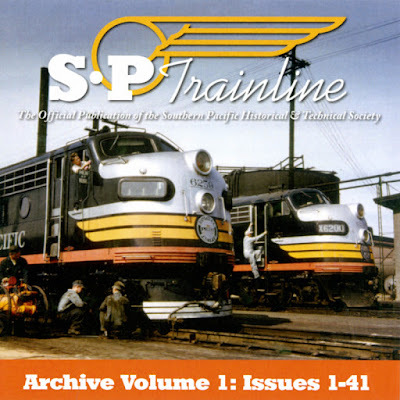 Through the years, Trainline has contained an immense amount of information about the Southern Pacific, from all eras. Though modeling information has been in the minority, the quality of that modeling information is also excellent. This publication is naturally of greatest interest to SPH&TS members and SP modelers generally, but in addition I hope that the general modeling community may wish to avail themselves of this resource. I think they would all find it interesting and rewarding, and the price is certainly modest. Back in 2011, I wrote a series of posts on my car fleet planning, divided by car type (you can find them all by using “choosing a model car fleet” as a search term in the search box at right; or you can consult the list of the entire series in this post: http://modelingthesp.blogspot.com/2013/02/keeping-model-car-fleet-under-control.html ). One of those posts, the one relevant to the present post, was a broad commentary about box cars, and it is at this link: http://modelingthesp.blogspot.com/2011/06/model-car-fleet-12-box-cars.html . I have discussed in a number of prior posts the suggestion originated by Tim Gilbert and Dave Nelson, referred to as the Gilbert-Nelson idea, that freight cars observed in many situations scale with the size of each car owner’s fleet. I give some background and elaboration of the idea in the following post: http://modelingthesp.blogspot.com/2012/12/choosing-model-car-fleet-numbers-part-2.html ). I continue to follow that idea in choosing foreign-road cars, especially box cars, for my layout. A second, additional idea I have tried to follow whenever possible, when choosing which freight car of a particular railroad’s fleet, is to select a “signature” car whenever possible. The idea of signature cars essentially identifies distinctive and numerous cars owned by a particular railroad. There have been two of my columns in Model Railroad Hobbyist (MRH) going into this in much more detail, so I won’t discuss it further here. They were in the issues for April 2013 and March 2015. (You can download these and any other issues of MRH for free, at their website, www.mrhmag.com .) 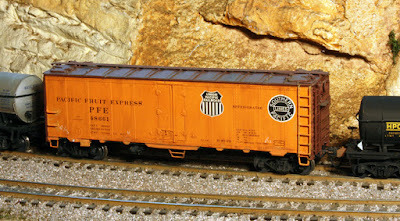 There was also a blog post on the subject, which can be found at this link: http://modelingthesp.blogspot.com/2013/04/signature-freight-cars.html . Here is an example. 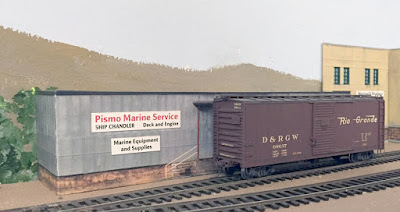 In the second of those MRH columns on signature freight cars, I identified two cars for D&RGW that I have in my fleet, a single-sheathed box car and a 46-foot GS gondola. But in the late 1930s, D&RGW began to add a number of all-steel box cars, which were built with some distinctive features, such as straight side sills, 12-panel sides and Duryea underframes. I decided to add one of those to my fleet also. There was a Sunshine kit for one group of those cars, kit 96.9, which builds into a car from the number series D&RGW 68000–68399, delivered in 1939 with wood running boards. Here is a photo of that model in completed form. The car is spotted at Pismo Marine Service in my layout town of Santa Rosalia. Eventually D&RGW had 2400 cars of this general appearance, including six-foot doors, though cars delivered after the series shown above had steel running boards. Another distinctive feature is the 12-inch lettering on the reporting mark initials, which AAR had recommended to be 9 inches. But that was only a recommendation, not a requirement, and D&RGW, like several other railroads, chose a different size for reporting marks. In fact, the retention of the ampersand in reporting marks by D&RGW also ignored a recommendation of both ARA and its successor, AAR, to eliminate that character from reporting marks. Again, only a recommendation. Another railroad of special interest for an SP modeler, though not of much Gilbert-Nelson significance, is the Cotton Belt (St. Louis Southwestern, SSW). Owned by the Southern Pacific after 1932, the Cotton Belt continued to follow its own shop programs until the 1960s, and in particular rebuilt a considerable number of older box cars to more modern configurations. But they only owned 5185 freight cars in 1953, similar to Western Pacific at that time, and far down the list of railroad freight car fleets ranked by size. 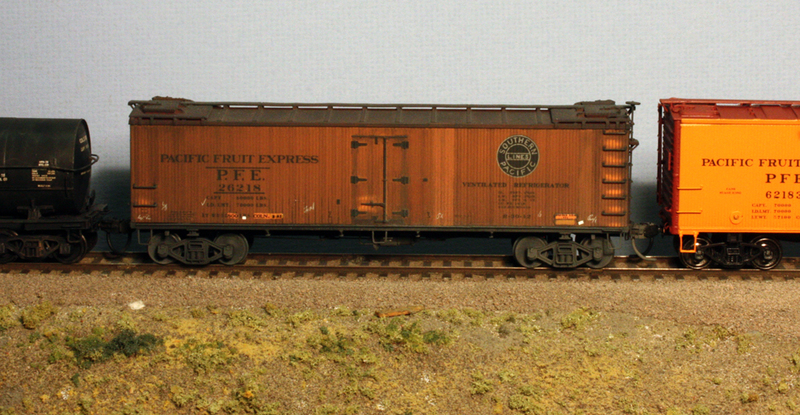 Many of the individual SSW rebuilt car groups are very interesting freight cars. Sunshine Models produced kits for a number of them, in particular kits 52.10 and 52.11 for the wood-sheathed rebuilds with “kitbashed” steel ends and 10 ft. 2 in. inside height. These cars originated in a purchase by SSW in the 1920s of 2500 wood-sheathed box cars from American Car & Foundry. They had Hutchins roofs and Murphy corrugated ends, and were only 8 ft. 6 in. inside height. They looked like the USRA cars built a few years earlier, though the USRA cars were 9 ft. inside height. The Cotton Belt’s 8 ft. 6 in. height was obsolescent even when the cars were built, and in the 1930s, Cotton Belt began to rebuild them. Most of the cars were rebuilt with 10 ft. 2 in. inside height, which at the time was pretty large. 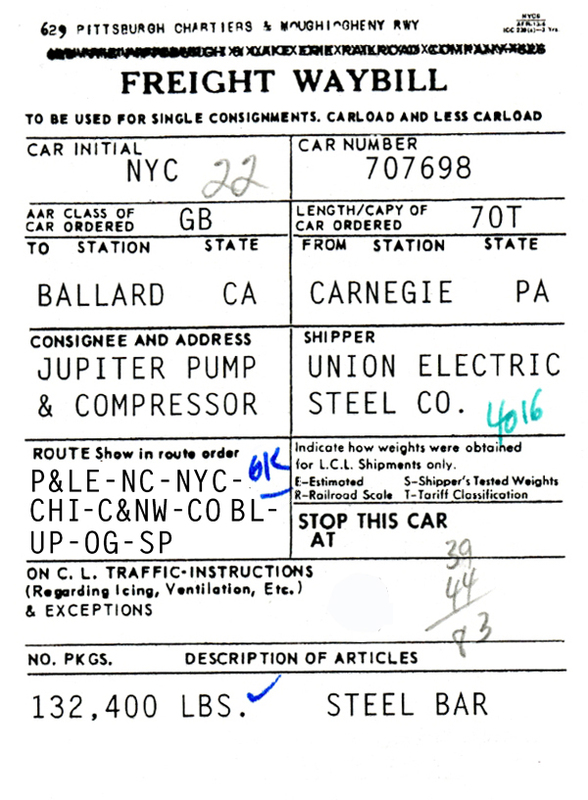 The contemporaneous standard car was the 1932 ARA box car, 9 ft. 4 in. high inside, and even the 1937 AAR standard box car was only 10 ft. inside. The increased height meant that Cotton Belt had to add an extending panel to the re-used steel ends. Sometimes these panels were sections cut from surplus Murphy ends, but some were made from sheet with welded-together carlines as stiffeners, giving quite an unusual appearance. (Kit 52.10 models the Murphy added panel, kit 52.11 the carline panel.) By 1938, over 1000 of the original cars had been rebuilt this way; by 1948, more than 2000 had been rebuilt, making these cars a “signature” car of the Cotton Belt. My Sunshine kit 52.11 was assembled by Dennis Williams and lettered and weathered by me. It’s shown on the house track in my layout town of Shumala, with a clear view of the extended steel end with its carline-reinforced panel. (You can click on the image to enlarge.) 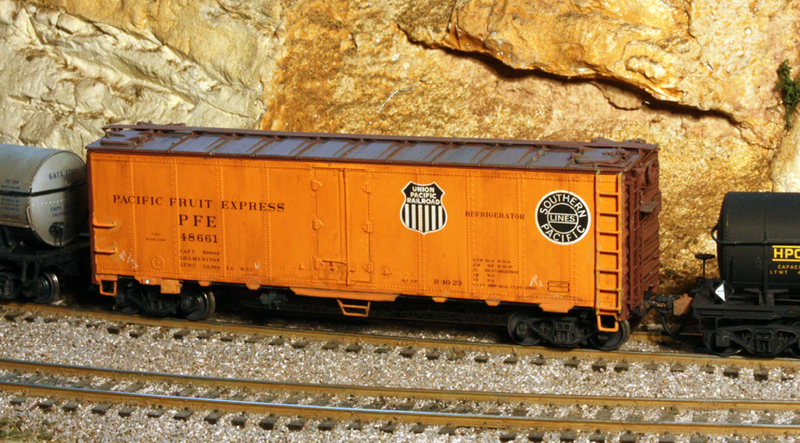 Cotton Belt did paint boxcar ends black in this era. These two cars, from D&RGW and SSW, are ones I found interesting to add to my freight car fleet, and do represent cars with a “signature” quality, even if not perhaps the first cars a person might choose for that category from either railroad. Both are often present in my operating sessions. For some time now, Kadee has been re-releasing their various HO scale truck types in a different design they call “two-piece,” meaning a split bolster. They are molded in a “High Gravity Compound,” or HGC, meaning higher density to increase truck weight to almost match metal trucks. Most important, from an appearance standpoint, they have truck springs molded instead of “working” or “real” springs. The news for me, and any other SP modeler for the transition era or earlier, is that they have finally extended this program to three older trucks: Andrews, T-section, and Vulcan. These were all used by SP early in the 20th century and thus are essential for SP modeling as late as the transition era. The trucks are available with either the formerly standard wheels, 0.110-inch wheel treads (Code 110) or newer “semi-scale” Code 88 wheels. These just have different Kadee stock numbers. Below is their announcement for the trucks with Code 88 wheels. 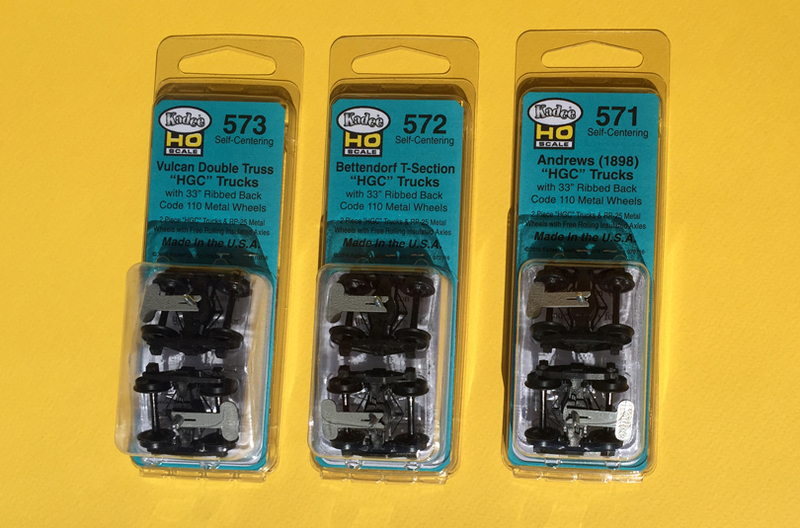 The 1571, 1572 and 1573 trucks are simply 571, 572 and 573 with Code 110 wheels. Note that these have ribbed-back wheels. As I’ve said in a number of places (most recently in my Model Railroad Hobbyist column in the September 2016 issue, which you can download for free any time at www.mrhmag.com), real truck springs look nothing at all like this, and one simply cannot see through them in this way. And of perhaps greater importance, these springs do not effectively cushion any model freight car that weighs less than half a pound, which is why I put quotes around the term “real” springs. They are mechanically cosmetic and visually incorrect. The Kadee Andrews truck is the early-design Andrews, with a long tie bar running under the whole sideframe, which SP used on several car classes. The T-section truck, from Bettendorf or other manufacturers, was very widely used by SP in the 1920s, for several different kinds of freight cars. And the Vulcan truck was also used by SP on several classes, particularly for stock cars and cabooses. That’s why I need and can use all three of these new trucks. Shown below are packs of all three, with Code 110 wheels, which I may well swap out for Code 88 wheels before putting these under freight cars. I was really pleased to see these trucks released, and will be using them on future models, as well as to replace some of the older Kadee “sprung” trucks under some of my freight cars. I would advocate their use by anyone with appropriate freight car models which should have these particular trucks. In my three previous posts on these tank cars, I showed prototype photos of asphalt cars, along with models built to reflect those photos. 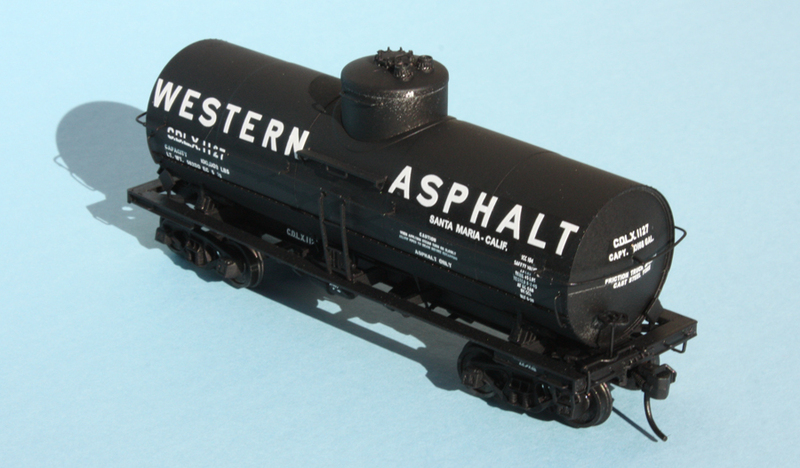 The most recent post has links to the first two of those posts (that post can be found at the following link: http://modelingthesp.blogspot.com/2016/09/asphalt-tank-cars-part-3.html ). But all the model tank cars shown previously were unweathered. Now I want to address weathering. 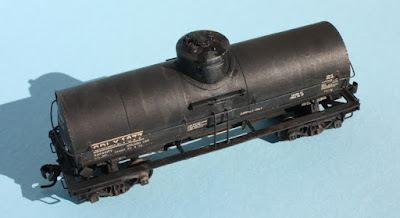 My weathering procedures using acrylic tube paint have been described in a pair of Reference pages, as they are called, and links to them can be seen at the upper right of this blog page. As I mention there, I weather most cars in two steps, sides and ends separately from roof, top or interior. But with tank cars, that really isn’t a practical division, and they have to be weathered in one session, over the entire car. But with a little practice, this works all right. After giving it a weathering wash of the kind just described, CDLX 1127 is shown below from almost the same angle. You can compare the two views. Cutting down on the brightness of the white lettering makes a big difference. Next, I wanted to suggest the crusted asphalt spills that are visible in some of the prototype photos of these cars. It’s natural that the spills would look that way, because asphalt is quite viscous and sticky, and spills can readily clump and build up. Acrylic tube colors are a little that way too, so my first effort was to daub brown and (mostly) black onto the dome top and sides. In the photo below, you can see the three-dimensional quality of the result. I did the same to the CDLX car leased to Shell Oil, CDLX 1077 (see my second post in this series), though I chose not to weather the car to as gray a state as with CDLX 1127. Both these weathering jobs have satisfied me with their overall appearance. There have been suggestions that gluing a little fine sand on the dome surfaces, before doing the spills, would give a rough texture to the spilled area. I haven’t tried that. One of my earlier models was given the spill representation by just backing away with the airbrush until the paint plume dried in the air, creating the familiar “sandy” surface that occurs that way. This looked all right but was pretty uniform. 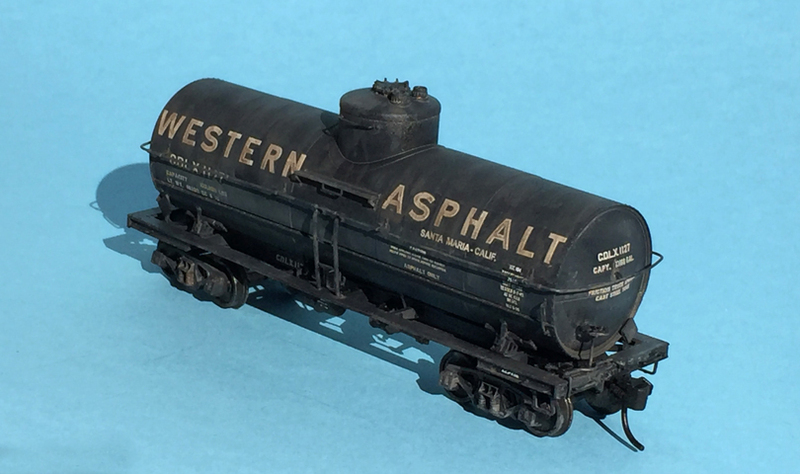 That is what you saw in my second post in this series, on the Overland brass model of the Western Asphalt scheme. Last, let me mention again that the reduced price for the starting point of these models, the Proto2000 (now Walthers) convention tank cars, is still in force. That special price, for a limited time only, is $10 for the car, $7 shipping within the U.S. Go to the 2011 convention store (still open at: http://www.x2011west.org/store.html ) to buy the cars, as long as supplies last. These “asphalt” acrylic build-ups are a little bit of a caricature, but in HO scale, I think they are all right, and in fact look as they should at layout viewing distance: just noticeable as some extra spillage. Perhaps not good enough on a contest model, but fine for my purposes.